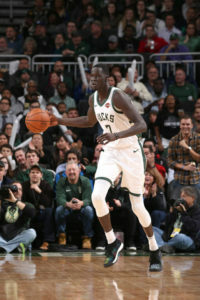 The Milwaukee Bucks used a 31-point fourth quarter to pull away for a 114-102 win over the Utah Jazz at Fiserv Forum on Monday night. The Bucks (28-11) held the Jazz to 40 points in the second half and 16 points in the fourth quarter. Utah led 62-58 at the half, shooting 53.5 percent from the field (23 of 43). They increased their lead to 11 points early in the second half. That’s when the Bucks started to chip away. Giannis Antetokounmpo had 30 points to lead the way. Malcolm Brogdon added 21, but it was Thon Maker that gave the Bucks the biggest boost off the bench, scoring 15 points and pulling down five rebounds. Maker saw his minutes go up after D.J. Wilson missed the game with a hip pointer. He scored seven key points in the fourth quarter. The Bucks still haven’t lost back-to-back games this season. Milwaukee went 5-1 on their six-game home stand. Now, the Bucks will play 13 of their next 18 games on the road, leading up to the all-star break. It starts with a road game at Houston on Wednesday night.